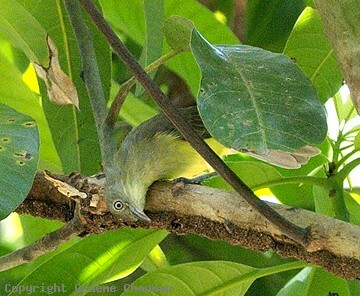 Green-backed Honeyeaters are rainforest specialists and in Australia are restricted to the east coast of Cape York as far south as Princess Charlotte Bay. A fairly nondescript species, they spend most of their time in the outer foliage where they can easily go unnoticed unless you hear their chattering little call. Occasionally they may be found closer to the ground in shrubbery around rainforest edges. Little is known about their life history. Presumably when breeding they would maintain a small territory and occur in pairs, but most observations are of single birds and occasional small groups. They never form flocks and appear to be fairly sedentary.